A few days ago I did something I don’t usually do: a slight repaint on one of my models. 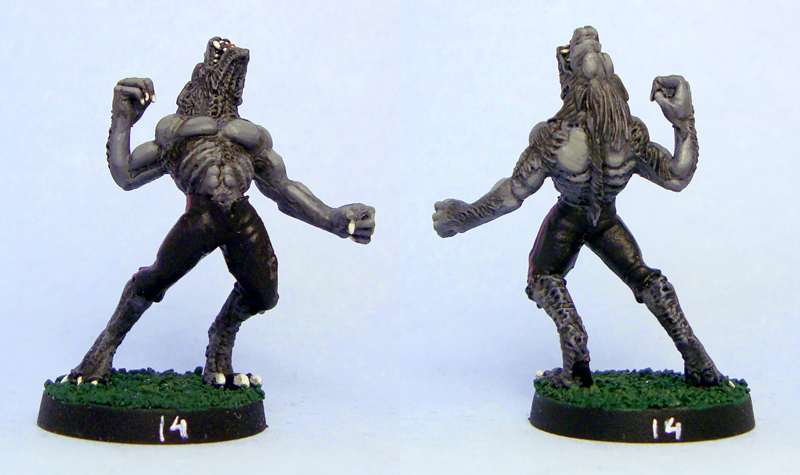 I had this werewolf from West Wind, who I originally painted for my Underworld project (now sadly defunct), and happened to need another werewolf for my Blood Bowl team, the Drakwald Ravens. 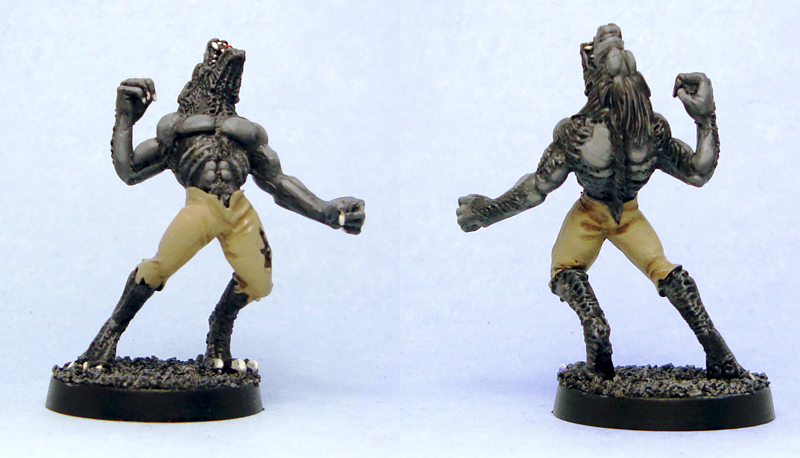 A quick pant and base repaint later, I had a new player, Anti-Christian Wolff. Apart from the base and the pants, I didn’t change the model and the differences apparent are due to photography. This repaint was actually a step back, due to my decision to not highlight the black on the Ravens’ uniform. It does make for a sleek, sporty wolf though. Anti-Christian’s debut started out pretty impressive, as he scored what proved to be a winning 2-1 goal against the crafty bourgeoisie dwarves of Blackpit Arsenal. A few turns later a disastrous sequence of dice rolls meant that poor Anti-Christian dropped dead – from heart failure due to the elation from the goal, we concluded. That’s Blood Bowl for you. Although Anti-Christian looks good in his new striped cycle shorts I am sorry to hear that the Underworld project is mothballed for good. I had thought that that one would resurface eventually. On the other hand, Anti-Christians memorable debut made me laugh out loud. Anyway, when it comes to minis, I’ve found that projects are extremely rarely gone for good. I’m sure the Underworld project will make an appearance, when I get to a suitable state of mind, fear not! Maybe I should’ve said “currently defunct”, come to think of it.